Puglia (Apulia), the heel of the Italian boot is a long, mostly flat region with a prolific wine production. In the past, the region often surpassed Sicily and Veneto in output. As traditional markets for strong blending wines have diminished, Apulia’s producers have increasingly put the accent on premium quality wines. One of these producers is Tenute Rubino. The Rubino vineyards are located along an area of 50 hectares at 8 kilometers north of the town of Brindisi along the Adriatic coast. The grapes are Primitivo, Negroamaro, Malvasia Nera, Susumaniello, Montepulciano, and Sauvignon blanc. The soil is mainly calcareous, with a significant amount of sand. The proximity to the sea with his breezes, and a mild climate, favor perfect maturation of the grapes. This family dream came true in 1999. 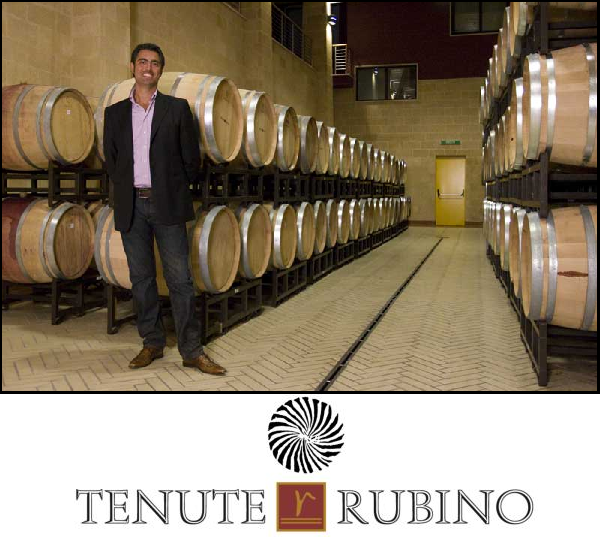 After acquiring the estate, Tommaso Rubino, planted the vineyards focusing on quality standards that were at the time unheard of in Southern Italy. He planted new varieties of grapes, and replaced old systems with modern ones. During the entire production process, from tending the vineyards, wine-making, bottling and aging the Rubinos rely on state-of-the-art techniques and technology.